Here at DutchCrafters, we offer a wide variety of country style furniture, and one of our popular picks for casual country seating is our solid wood Amish Fancy Turned Leg Barstools. These wood stools are backless, with a rounded top and legs that won't quit. Turned just so to dress up the meal while maintaining a casual air, these wood stools are available in 3 heights and come in choice of oak or cherry wood. 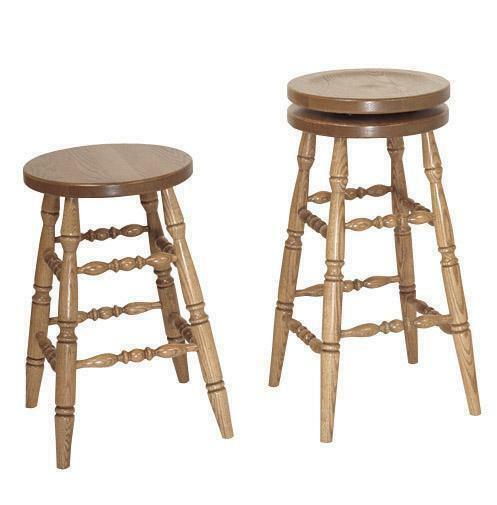 The Amish Fancy Turned Leg Barstool makes a great candidate for restaurant and pub seating. Our Amish furniture is solid wood, built to be strong and beautiful and can take on daily use with zest. View our B2B profiles to see the solid wood furniture we've provided throughout the country. *The profile seat is a deeper scoop all the way that contours you in the seat.